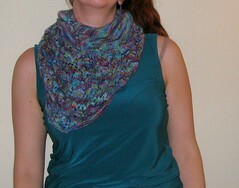 Ysolda Teague's Ishbel was a fun knit. I used a skein of Araucania Ranco Multy (that's how they spell it) and followed the directions for the small for the stockinette portion and the large for the lace portion. 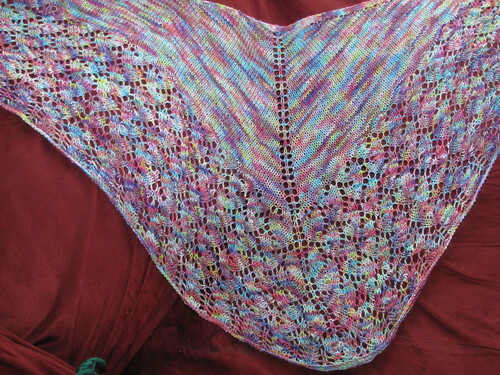 I had a spare skein on standby, but ended up not needing it at all. Ohhh, pretty! I can't wait to make this one myself.... I got Malabrigo Sock for it.... Fingers crossed!! Beautiful! Ah, you shouldn't have mentioned the bra strap. I didn't notice until you pointed it out! Malabrigo sock it totally Yummy. And as for the bra strap, it's not almost all I see. But yes, I should have considered not making it all the rest of you see to.